This week is butterfly week in Exploring Nature With Children, the wonderful nature curriculum we are using. We have been looking out for any butterflies we spot in our garden or out on our walks, as well as observing our own butterflies who recently hatched from their cozy pupas. Waiting for them to emerge has been a good lesson in patience for all of us! They are incredible to watch up-close, especially when using a magnifying glass. As an art activity, Frida made some simple butterfly prints. 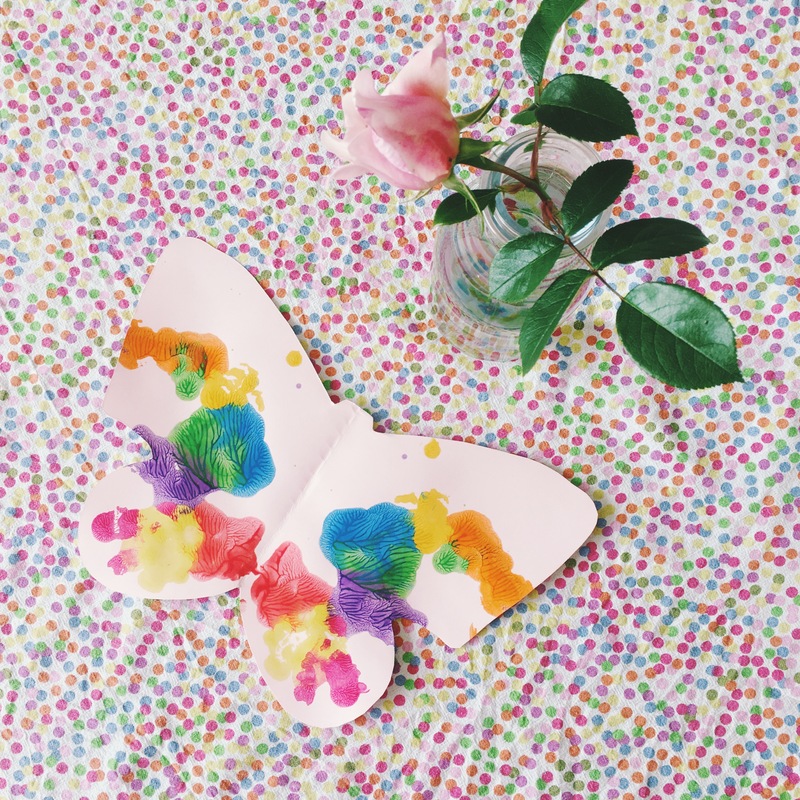 She is not usually into pre-planned crafts, but she really loved making these simple prints and watching the paint make symmetrical patterns on the butterfly wings. There were also some fine motor skills involved as she cut one of the butterflies out herself (if there are scissors involved she will generally be keen to take part!). We may make more of these as Frida enjoyed them so much, or I might draw some simple butterfly outlines for her to paint or colour in, perhaps inspired by the ones we have been reading about. A Butterfly Is Patient. I love the aesthetic of this book and it compliments the reading we’ve done really well. The Story of the Butterfly Children. A very sweet (but decidedly non-Montessori!) and simple story book. RSPB First Book of Butterflies and Moths. Great for nature walks and identifying local butterflies we find. Caterpillar Butterfly. From the brilliant Nature Storybooks series. If you get just one book about caterpillars or butterflies for your child, get this! Insect Emporium. Whenever we get this out to look at I’m struck by how beautiful it is. 1001 Bugs to Spot. Frida has been really enjoying this spotting book. It’s a great book both for language acquisition and numeracy, as well as developing her attention to detail and concentration span, and sparking conversations about different habitats. I’ve just bought a second hand copy of 1001 Animals to Spot which is also brilliant. Caterpillars and Butterflies. This book is brilliant, really informative and illustrated with photographs rather than drawings. We’ve been just reading the butterfly pages as we read the caterpillar parts a few weeks ago. La Chenille Qui Fait Des Trous ie. The Very Hungry Caterpillar! This book is too simple now for Frida in English (though she loved it when she was younger) but in French it is perfect for expanding and solidifying her vocabulary. We are using these cards to learn about the parts of a butterfly. We have just finished using these insect fact cards during our morning time, learning about one insect a day including their name in French, and have moved onto onto these butterfly fact cards (I will keep the moth cards for when we look more closely at moths later in the year). Next week in Exploring Nature With Children a museum trip is suggested, so I probably won’t post about that (we will visit Kew Gardens and might brave the Natural History Museum too) but the week after is all about bees so check back soon for what we’ll be reading and doing! I love the butterfly print idea! That looks like a fun activity for any age. I will have to try that one with my little one soon. Thank you for the complementary book suggestions as well.